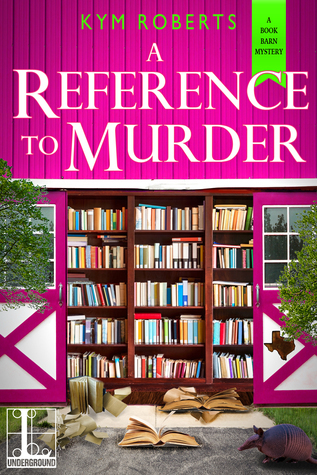 Bea's Book Nook: Bea Reviews A Reference to Murder & Perilous Poetry by Kym Roberts & A Giveaway! 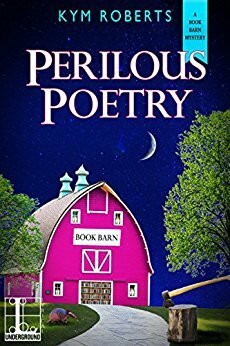 Bea Reviews A Reference to Murder & Perilous Poetry by Kym Roberts & A Giveaway! Dalton’s brother also vanished seven years ago—and Charli is thrown about whether Dalton is a villain or a victim. After a close call with an assailant wielding a branding iron (that plays havoc with her hair) and some strange vandalism on her property, she’s going to have to team up with the sheriff to untangle this mystery, before she gets gored. I confess, I totally got this book for the cover. I don't think I even bothered reading the blurb, lol. The cover, and the fact it was a mystery, sold me. Of course, being me, I got busy and it fell down the TBR pile. Then I requested the third book, having completely forgotten about this book, and I read number three first. Cuz that's how I roll, lol. Anyway, that review is down below, after this one. Once I realized that "Oh hey, I have book two and should read it", I dove into this one. And now, I'm waiting for book four, coming next year. And I still need the first book. So, Charli Rae Warren, or Princess as most people call her, is back home after 17 years and helping her dad run the town bookstore and helping out at the annual rodeo event to raise funds for retired rodeo riders. Some big name riders have come to town and it doesn't take long before there's all kinds of public drama, and some private drama too. Since I read the books out of order, I already knew the fate of some of the characters but that didn't lessen the story's impact; I still wanted to know what happened and the whys. One of the riders, Dalton Hibbs, is involved with Princess's good friend, Scarlet. He's a top bull rider and a player. His brother Wyatt, also a top bull rider, went missing years ago. And then Dalton goes missing. At first, people think it's a publicity stunt but then several graves are found, one of which has his brother Wyatt's belt buckle. There are attacks on Princess (the woman, not the armadillo who's also named Princess) and other mysteries. And there's some romance, a triangle actually. It was in book three also and I'm really hoping it gets resolved in book four or I'll be done with the series. Princess needs to make a decision and move on. "A Reference to Murder" had romance, mystery, danger, action, intrigue, and humor. The plot got overly complicated at times but it kept me reading. All of the characters were engaging though Princess's attraction to Cade was incomprehensible to me; he regularly blew her off and played games with her. I've never been to Texas but the depiction of small town life seemed a mix of real (I've lived in several small towns in New England) and cliches. The armadillo was cute and had lots of personality. The various mysteries had twists and turns and kept me guessing. Princess's relationship with her father is still healing after her long absence (she ran away 17years ago for reasons that still aren't clear to me) and the depiction was well done, sweet but cautious, fragile and yet deep. And of course, parts of the story were set in a bookstore. Roberts made good use of the setting and it even helped Princess figure out a clue. I enjoyed the story and I'm looking forward book four. So, as I mentioned above, I read this book then realized I also had book two, the previous book, on my Kindle so I dove right into it. I requested this one for review because the blurb was appealing. I enjoy the downhome charm and quirky characters. Quirky can be iffy for me in books as often the characters are so quirky as to be A) unbelievable and B) annoying. Fortunately Roberts didn't fall into that trap and the characters are endearingly quirky. Charli, AKA Princess, has been working with her father at the family bookstore and slowly building business up. Then her cousin develops an app that can help her business, and oh boy, it's a fun app. Why doesn't this app exist in real life and if it does, someone please point me in the right direction. Anyway, murders begin happening around town and they're based on murders from the popular Midnight Poet Society mystery series but using the app. Soon Princess is up to her neck trying to help her cousin, solve the murders, stay in the sheriff's good graces, and figure out her love life. The sooner she does the latter, the happier I'll be. I have little patience for love triangles in romances; I have even less when they're in mysteries unless they're part of the mystery. Apart from that, and how annoying Cade the mayor is, I enjoyed the story. I especially enjoyed Princess's aunt Violet, her cousin Jamal, and the sheriff, Mateo. I loved seeing their interactions, especially the familial ones. They also added depth to the story. Once again, Roberts made good use of the bookstore as well as events such as author readings and signings. And I want a Mystery Moms group by me though since I'm not a mom, it would need to be a non-mom version. Twists and turns, action, romance, books and book lovers, mysteries, "Perilous Poetry" just about had it all. The Book Mysteries are quirky, fun, engaging cozy mysteries. Please leave a comment and a way to contact you if you win. For bonus entries, follow Bea's Book Nook on goodreads (follow my reviews or add as friend, your choice), Twitter, or Facebook. Each follow is one extra entry; leave a comment with how you followed, and under what name.Winner will be chosen via Random.org. This series sounds appealing (bookstore? murder? small town? Yes, please.) But like you, I'm really NOT a fan of love triangles or long, drawn-out, will-they-won't-they relationships. I hope that aspect gets resolved soon!